Tahiti Tote Pattern - Retail $10.00 [PSBD118] : Wholesale Purse Patterns, Purse Patterns at wholesale prices for quilting shops, craft stores, and fabric shops. 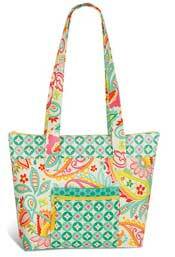 The Tahiti Tote pattern is a practical tote bag with a secure zipper top, lots of pockets, and a convenient front cell phone pocket. Finished size is 15 1/2" W (at the top) x 11 1/2" H x 4" D.